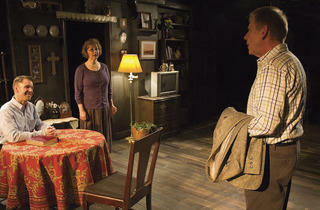 Tracy Letts’s 2003 drama about a Midwestern man’s crisis of faith gets a sensitive, accomplished revival. 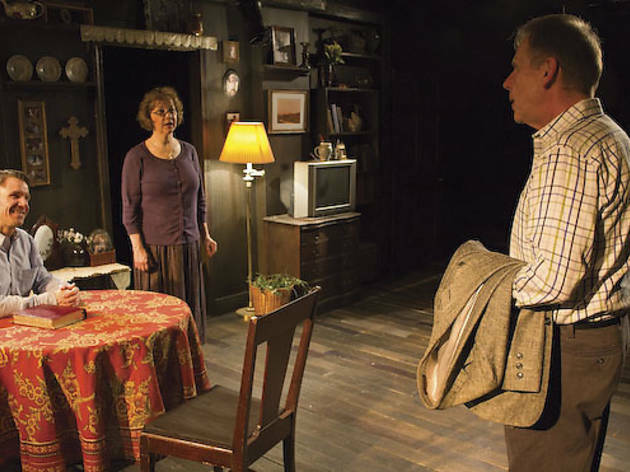 Letts’s third play, the tale of an average Nebraskan’s crisis of faith, marked a sharp departure from the extremes of predecessors Killer Joe and Bug and became the playwright’s first Pulitzer finalist, before he won the prize for 2007’s August: Osage County. I didn’t see the play’s 2003 premiere at Steppenwolf, where it was directed by Anna D. Shapiro and starred Rick Snyder, Rondi Reed and Michael Shannon, among others. But based on Redtwist’s sensitive, accomplished revival—marking a very impressive directorial debut by actor and designer Jessop—I think this is a play that might be better seen in such an intimate production. Ken (Spencer), a middle-aged man living comfortably in Lincoln with his wife, Nancy (Graves), wakes up one night with the chilling realization that he’s lost his belief in God. On the advice of his pastor (the perfectly unctuous Michael Sherwin) he takes a solo vacation to London, where he falls into an unlikely but freeing friendship with a hotel bartender (Adrian Snow) and her sculptor roommate (Andrew J. Pond) while Nancy and their grown daughter, Ashley (Julie Dahlinger), fret at home. The trajectories Letts sets up feel implausible on paper—but then, what truly life-changing events aren’t? The key is the respect that Letts, Jessop and Redtwist’s cast demonstrate for their characters. Stephen H. Carmody’s Swiss-Army-knife scenic design does heavy lifting as well, astoundingly enabling Redtwist’s storefront space to accommodate Letts’s cinematic quick-cuts without dragging.